Breeding fish in a garden pond, normally this is something that if you let nature take its course the fish will breed given the right conditions. The fish will normally breed in early spring when the weather gets warmer or sometimes in late summer. You will notice a lot of activity in the pool, normally early morning and can sometimes last all day. The female will first of all look for the area where she wants to lay her eggs, perhaps in the clumps of oxygenater plants or blanket weed attached to the plants or the side of the pool. She will then attract the attention of the male fish and they will start to chase her around the pool, all the males will try to get in on the act and sometimes they may be fighting each other to get near the female. When the female is ready she will enter the chosen areas where the males will brush alongside of her, and then she will expel lots of eggs. Then the males will secrete a substance called Milt which will adhere to the eggs which in turn will attach themselves to the plants etc. as they are sticky they will stick to almost anything, form the sides of the pool to the plants and roots. The eggs are about the size of a pin head and look like a tiny air bubble; there can be a few to several hun dred at any one time. The fish will eat most, as they are a nutritious food source; hopefully some will be hidden from view and taste. After a few hours some will turn a milky colour, these are called fungus eggs and are not fertilised or are infected. 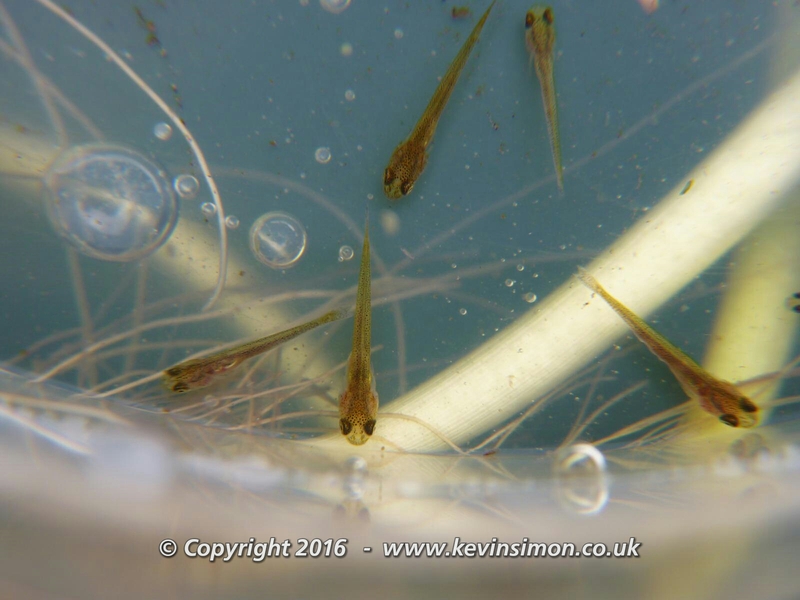 Some will be clear and these are the ones that are fertilised and will grow to become Fry (baby fish). After a few days if you look carefully you will notice a small dot inside the egg, this is the formation of the eyes. Depending on the temperature and weather in between 7 to 10 days they will hatch out, where they will attach themselves to the plants or side of the pool, by this time they are about 1/8th of an inch in length and look like a tiny twig. Eventually after about 7 days they will become what is called Free Swimming, that is they will start to move about the plants looking for minute particles of food. After a couple of weeks if you look carefully you may notice the Fry swimming in amongst the plants, especially if you gently move the plants, by this time they will be about ¼ -1/2″ in size. The normal goldfish Fry will be a dark brown colour and can stay like this for about 12 to 18 months depending on water quality etc. some will change to orange or gold with varying degrees of dark or light pig mentation’s. Some may stay dark brown, as this is the original colour and have only become known as GOLDFISH due to selective breeding. with eggs, i.e. starts to get fat at the rear, on the male you will notice small Pin Head size white spots appear on its gill plates. If you want to breed in the same pool, then a few days before you are going to be ready to look after them, and the weather is going to be warm, start to do a partial water change.
. Another thing you could do is wait for the eggs to be laid, then transfer them along with the plant matter to a safe set up tank or separate pool to let them hatch safely. An Aquarium at this time could be useful. When you notice any baby fish in any pool and you want to try to raise them separately you will need to feed them special foods that can be purchased from most good aquatic centres. Alternatively you could try dried boiled egg yolk or powdered milk, but only feed sparingly and only if you have good filtration and healthy water management. Removal of eggs from the pool or set-up to look after them yourself can be time consuming and heart breaking as you will sustain a lot of losses, perhaps all may be lost from any one breeding. Even though you may start off with several hundred you may lose them all. It normally has nothing to do with the way you have looked after them, it could just be that they where not developed enough for survival. I have had this happen to my father a good many times and have lost all the breed for reasons unknown, but it still does not stop me from continuing to raising my own fish. I have listed the above using GOLDFISH as the example, as these are the easiest to control. Koi, Tench, Rudd, Orfe etc. can be a little harder to spot or stimulate etc. and unless you are set up to look a after specific type of fish, it may be best to leave it to Mother Nature. Again if anyone wants specific help or advice on the above then just let me know.